–by Jen Cunningham. Photos by Joan Marcus. I had to see Andrew Lloyd Weber’s Love Never Dies, twice. The first time I left convinced that the Phantom was a narcissist, and I was completely irritated with his character. I think my mind was too wrapped up in current day politics. Suffice to say, the #MeToo movement and the Phantom wouldn’t exactly be on par with one another. Then I realized I needed to step out of my head, and step into the late 1800’s and the melodramatic world of the opera. Sometimes its hard to leave your current mindset, and accept the Phantom’s “love me, or else” behavior. It is 2018. 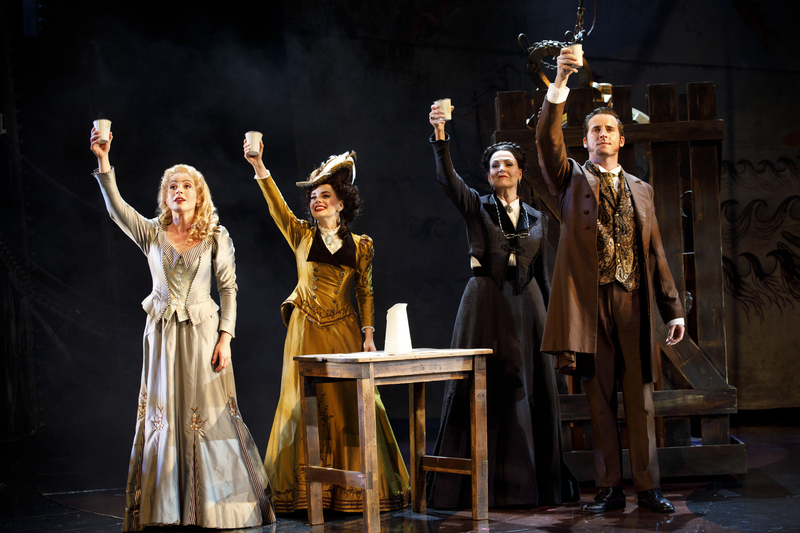 “Dear Old Friend” – Mary Michael Patterson (“Meg Giry”), Meghan Picerno (“Christine Daaé”), Karen Mason (“Madame Giry”) and Sean Thompson (“Raoul, Vicomte de Chagny”) star in Love Never Dies. Photo: Joan Marcus. So I saw it again…With an open mind. I really don’t understand why the previous critics didn’t like it. I will be honest, I really didn’t like the first one. The ending seemed off to me. I really didn’t feel like she chose anyone. I felt more like it was a metaphorical battle between career and family. A battle that most of us are all too familiar with. So in my opinion, the sequel, made the first one better. Love Never Dies is a spectacle of color and motion. Time never stops spinning and neither does this show. The first act is a bit slow, but act II will take you through a myriad of emotions. Set in 1907, ten years after the phantom had been smuggled into America by Madame Giry(played by Karen Mason). Christine had become a Parisian sensation, but her personal life was tattered. Now married to Raoul(played by Sean Thompson), Christine Daae(played by Meghan Picerno) had become the breadwinner for her family, while Raoul had developed a drinking and gambling habit that was draining their family financially. Christine accepts an invitation to open Manhattan opera house. An opportunity to turn their financial future around and get out from underneath the debt her husband had created. But the Phantom see this as the opportunity he’s been waiting for. Ten years without his precious Christine was far too long. So he sends some interesting characters to intercept them. But everyone has secrets they would rather not reveal. The Phantom intercepts more than he bargained for when his precious Christine arrives with a ten year old son, Gustave(played by Jake Heston Miller). Gustave is a bit of a musical prodigy. A reflection of his mother, or someone else? Richard Koons (“Squelch”), Katrina Kemp (“Fleck”) and Stephen Petrovich (“Gangle”) star in Love Never Dies. Photo: Joan Marcus. Once the family is intercepted they are brought to Phantasma on Coney Island. This wonderland where amusement park meets vaudeville. Christine alone in her dressing room was soon met with the blast from her past. It wasn’t love at first sight but you learn sooooo much about the choice that she really made. There are very emotional moments in Act II; ones that I can’t really touch on without filling the internet full of spoilers. This book, to me, has so much more depth than the original. I wish I could read it in its original form. I know its been through at least one dramaturg and rewrite. I am nosy. I would love to see what the artist was trying to say with the original book. To give you an idea- I was running this show by Melissa (my blonde counterpart that is seen with me at most of these performances as my plus one, she’s my best friend not my wife…people get that confused a lot). She and I were going through each scene and my teenager comes around the corner and asks “Is this a new movie? Is it on Netflix or Amazon?” Even my teenager who has zero interest in my shows half the time, was dying to hear what happened next. Don’t let the opinion of a few, keep you from experiencing something new. It’s flashy, and creative, and WILL leave you humming the signature song “Love Never Dies” for days following. This is a GREAT date night option. I think most people would agree that Jake Heston Miller, who plays Gustave, son of Christine Daae, steals your heart almost instantly. His musical talent coupled with his innocent curiosity made him the perfect choice for this part. He reminded me of my son Jack. Meghan Picerno was wonderful as Christine Daae, but EVERYONE is talking about her. I want to talk about Mary Michael Patterson, she plays Meg Giry, daughter of Madame Giry. These two smuggled the Phantom from Paris to Coney Island, where they helped him open Phantasma. The number “Only For You” really showcased her talent as a performer. Her voice and showmanship, I felt, were as good as Picerno. I think that the emotional depth Patterson has to reach at the end of act II could give Picerno a run for her money. Patterson takes act II to another level, one that I feel earns her far more praise than shes been given so far. Last but not least Gabriela Tylesova, set and costume designer. All I can saw is WOW!! Speaking in terms of just costume and set design this show is a masterpiece. The colors and mystical sets are spectacular. The way they spin and transform will wow all ages of theatre-goers. 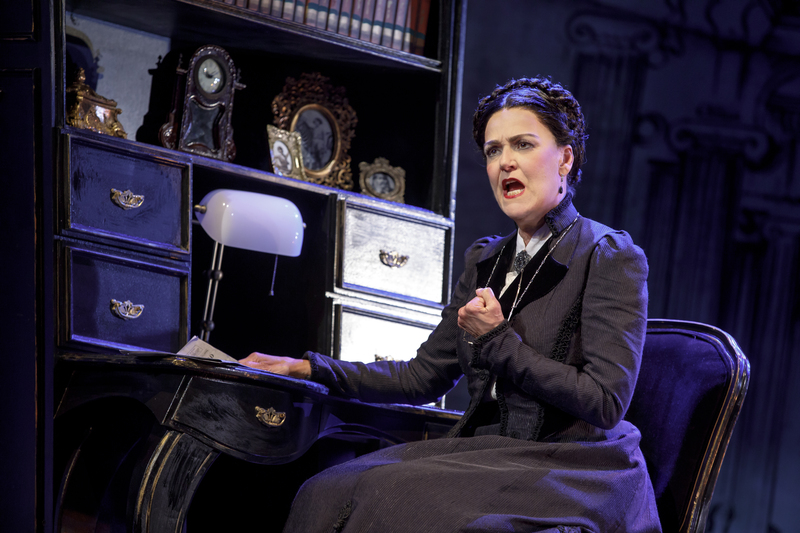 Karen Mason (“Madame Giry”) stars in Love Never Dies. Photo: Joan Marcus. Love Never Dies runs at The Fabulous Fox Theatre through September 30th. Tickets range from $35-$99. For more information call 314-534-1111 or go to Metrotix.com. Sean Thompson (“Raoul, Vicomte de Chagny”), Christian Harmston (“Gustave”) and Meghan Picerno (“Christine Daaé”) star in Love Never Dies. Photo: Joan Marcus. Meghan Picerno (“Christine Daaé”) stars in Love Never Dies. Photo: Joan Marcus. Meghan Picerno (“Christine Daaé”) and Bronson Norris Murphy (“The Phantom”) star in Love Never Dies. Photo: Joan Marcus. Sean Thompson (“Raoul, Vicomte de Chagny”) stars in Love Never Dies. Photo: Joan Marcus. Jake Heston Miller (“Gustave”) and Bronson Norris Murphy (“The Phantom”) in a scene from Love Never Dies. Photo: Joan Marcus. “Devil Take the Hindmost” starring Bronson Norris Murphy (“The Phantom”) and Sean Thompson (“Raoul, Vicomte de Chagny”). Photo: Joan Marcus. “Only For You” – Mary Michael Patterson (“Meg Giry”) and the Ensemble of Love Never Dies. Photo: Joan Marcus. Bronson Norris Murphy (“The Phantom”) and Meghan Picerno (“Christine Daaé”) star in Love Never Dies. Photo: Joan Marcus. Jake Heston Miller (“Gustave”), Meghan Picerno (“Christine Daaé”) and Sean Thompson (“Raoul, Vicomte de Chagny”) star in Love Never Dies. Photo: Joan Marcus. “The Coney Island Waltz” featuring Richard Koons (“Squelch”), Katrina Kemp (“Fleck”), Stephen Petrovich (“Gangle”) and the Ensemble of Love Never Dies. Photo: Joan Marcus. Jake Heston Miller (“Gustave”) and Meghan Picerno (“Christine Daaé”) star in Love Never Dies. Photo: Joan Marcus. Richard Koons (“Squelch”), Katrina Kemp (“Fleck”) and Karen Mason (“Madame Giry”) star in Love Never Dies. Photo: Joan Marcus. Bronson Norris Murphy (“The Phantom”) stars in Love Never Dies. Photo: Joan Marcus. Katrina Kemp (“Fleck”), Stephen Petrovich (“Gangle”) and Richard Koons (“Squelch”), star in Love Never Dies. Photo: Joan Marcus.